The Caddis Fly Shop will deliver all the latest models of wading coats & jackets by Simms and Patagonia. - Shipped Free. Superior fly fishing rainwear and waterproof rain coats. Fly fishing crazies want to be on the water in rain and shine, sleet and snow, blazing drought, monsoon, tornadoes, and hurricanes. Rain coat, guide jacket, rain gear, and rainwear makers like Simms, Patagonia, and Redington use materials like Gore Tex and other waterproof or rain and wind resistant gear just like a guide, even an inexperienced guide who would want to keep the rain out of his or her coat or jacket. 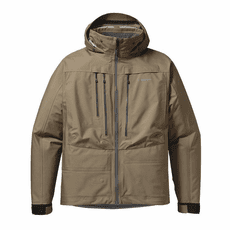 Every Simms, Patagonia, and Redington guide jacket, rain coat, rain gear, guide coat, and specialty rainwear is designed, tested, sold, and backed by fly fishing professionals. We stock the whole line, practically every item of rain gear, guide jacket, rain coat, rain jacket, fly fishing vest, and fly fishing rainwear from Simms, Patagonia, William Joseph, and Redington, so we know our stuff. We stock the whole line of Simms rain and nasty weather gear, rain coats, and jackets like the Simms G4 Pro Jacket, the Simms Guide Jacket, the Simms G3 Guide jacket, the Simms Windstopper soft shell jacket, the Simms in-vest jacket, the Simms Windstopper softshell hoody, the Simms Gore Tex Paclite jacket, the Simms rivershed cardigan, and every concievable new piece of outerwear and underwear made by our friends at Simms. We also stock the cool (and warm) waterproof guide type rain coat and rain jacket by Patagonia; like the Patagonia SST Jacket, the Patagonia Deep wading jacket, and the Patagonia Men's Guidewater Jacket. Check out our occasional sale prices and standard fair trade values, along with free shipping and no sales tax, and you will see how great our selection of fly fishing coats, jackets, vests, the occasional rain pants, and wind-shells really is an amazing antidote to rain, really. Technical fly fishing gear and coats and jackets make it more pleasurable to fly fish in the rain, whether you are a guide or not, includes anything worn on the outside of technical inner wear, if that makes any sense whatsoever. Check out our rain gear and especially our Simms Guide coat, Simms Guide Jacket, Simms, Rain Gear, Patagonia Rain coat, Redington rainwear, and -- get the idea? Writing aboutrain coats, rain jackets, guide coats, guide jackets, and rainwear can just about make a fly fishing pro staffer bonkers. So what? Bring on the rain. We have Simms rain gear. 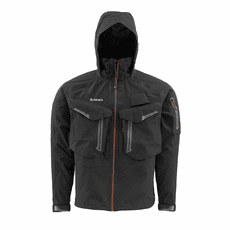 Bring on the wind, we have the Simms Guide Jacket. Bring on the dastardly show. We have the Simms and Patagonia guide rain jacket. This guide rain gear will keep ya warm in winter and cool in summer, within reason. Most of the time. Remember the free shipping and no sales tax deal. Whoa boy, save some dough here and get an absolutely fantastic rain coat, rain jacket, guide coat, guide jacket, guide gear, rain gear, or guide vest. Ha ha!